Ever known someone like this before? That person always glued to a mirror. They are obsessed with their own reflection and treating everyone else like dirt? Or worse, you somehow ended up being in a relationship with that person. 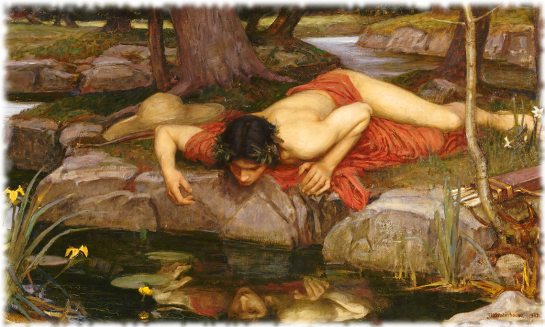 The son of a powerful river god and fountain nymph, Narcissus was the most beautiful being in all the world. His beauty was so strong that it seemed to hypnotize those around him, and he grew up showered with constant praise and admiration. It was nothing for him to reject the affection of his admirers with cruel words, or worse. The way he saw it, no one was good enough to match his stunning beauty. Yet his cruelty didn’t sway others from their love for him. One fateful day when he was a young man he went walking in the woods alone. Alone, because in his mind no one was worthy to even behold his footsteps that day. But someone did anyway. There on the path he was spotted by a mountain nymph named Echo, and she fell madly in love with him the moment she laid eyes on him. The problem was, Echo couldn’t talk to Narcissus because she had recently angered Hera, the vengeful and extremely jealous wife of Zeus. Hera had cursed Echo and robbed her of her own speech. Now Echo was only able to say the last few words of whatever someone had just spoken to her. Still, the sight of Narcissus was too much to resist and she followed him through the path in the woods. She went from tree to tree, hiding and peering out at the gorgeous young man. 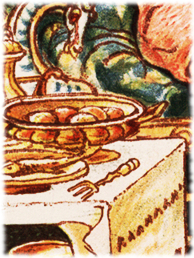 Soon Narcissus felt the hairs stand up on the back of his neck –he sensed someone was behind him. “Who’s there?” said Narcissus gazing into the dense forest around him. “Who’s there?” replied Echo in a soft voice. “Come out and show yourself,” said Narcissus. “Show yourself,” answered Echo from behind a tree. This went on for quite some time and Narcissus became impatient. He decided to try one more thing to get the mystery person to show themselves. “Let us join one another!” he said in the most persuasive tone he could. “Join one another!” said Echo brightly. Her heart swelled, delusional with love for Narcissus, she thought what he had said meant that he felt the same love for her. She came out from behind a nearby tree and walked up to him with open arms. “Embrace me,” said Echo sadly. She ran sobbing into the woods, her heart shattered into a million pieces. What neither of them realized was that Nemesis, the goddess of revenge, had witnessed this entire scene. 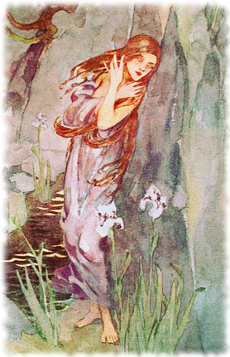 Knowing about Narcissus’ cruel history, she decided to do something about it. Feeling annoyed, Narcissus continued his stroll through the woods in hopes of forgetting the whole ugly encounter. He became thirsty in the afternoon sun, so he found a crisp pool of water and stopped to take a drink. 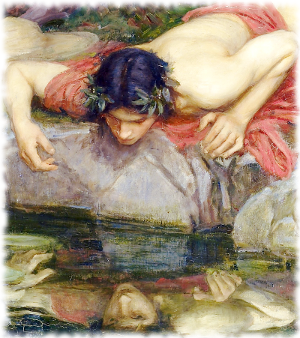 But as Narcissus lowered his lips to the water, Nemesis put her powers into action. The pool of water became like a mirror and Narcissus beheld the clearest reflection of himself he’d ever seen in his life. Immediately, he was hypnotized by his own beauty. ‘How stunning!’ he thought to himself. He perched above the water to get an even better view of himself. ‘Incredible,’ he sighed to himself. And it was there at the edge of the pool that he fell in love with the face he saw in the water. Much time passed with Narcissus still perched there. He would smile at the face, and it would smile encouragingly back. His heart beating faster, he would go to touch the face with his hand, but it only made the water ripple and distort the reflection. Many a sun rose and set over Narcissus, with him becoming desperately obsessed with this reflection that could never return his love. “Oh marvelous face, I loved you in vain. Farewell,” and he was gone. And over time she, too, would fade. All that remains of her now is the the sound of her voice when you hear an echo in the woods. Don’t fall in love with a Narcissus or you’ll end up an Echo! 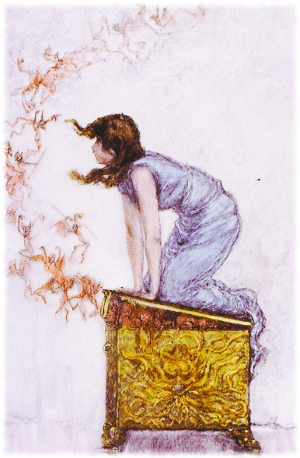 Ever heard the saying ‘opening Pandora’s box‘? It means to do something small that then gets way out of hand. Prometheus wasn’t like the other Gods and Titans that lived on Mt. Olympus. Instead of enjoying the paradise that life in the clouds provided, he liked to spend time on earth and walk amongst humans. According to Greek mythology at this time people on earth consisted only of men, something that the ancient Greeks thought was the ideal state of the world. Despite this though one thing wasn’t ideal about the setup, people lived in misery because they had to eat raw food each day and shivered from the cold every night. 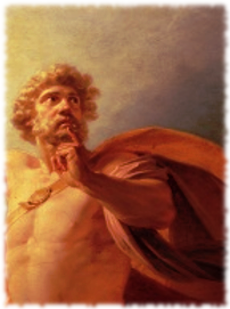 Prometheus saw how the people around him were suffering and decided to take action. He knew that on Mt. Olympus the Gods and Titans had a thing called fire that would make the life of humans a lot better, so he went up to Zeus, the king of all the Gods, and asked to take some fire down to earth. Zeus wasn’t having it though. He basically said ‘oh hell no’ and ‘GTFO with that idea’. See, Zeus felt that giving humans fire would make them too powerful and would eventually enable them to overthrow the Gods of Mt. Olympus and he wasn’t going to let that happen. Prometheus wasn’t intimidated though. 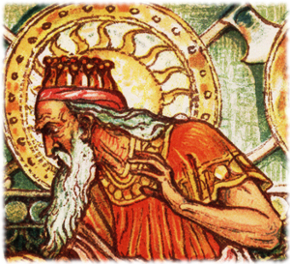 He knew he wasn’t powerful enough to challenge Zeus but he was a clever guy, so he used his mind to keep looking out for a way to get fire to humans. One day while he was on one of his long walks he noticed a stalk of fennel and a lightbulb went on in his mind. He broke off the stalk and excitedly headed up to Mt. Olympus. 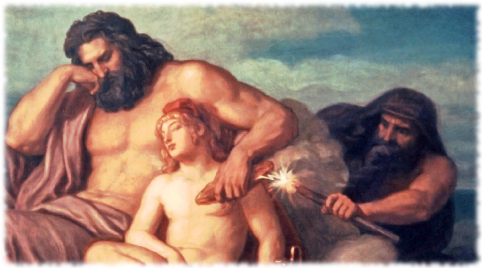 Prometheus waited until Zeus was fast asleep after an evening of partying on Mt. Olympus. He tiptoed slowly over to where Zeus kept the famous lightning bolt he used to throw lightning out of the sky, and then scraped some sparks into the fennel stalk. Inside the fennel stalk was a dry, cotton like material that would burn slow enough for Prometheus to get the ember back to earth. Once there he made sure that every group of humans had their own fire. It wasn’t long before Zeus found out what had happened, after all, the earth was that was normally pitch dark at night was now lit up with the fires people were using to keep warm. Zeus was shaking with anger. Prometheus had disobeyed and tricked him before, but this was the last straw. 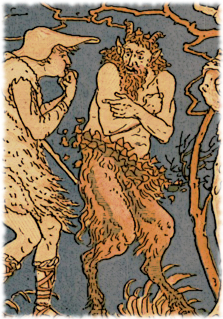 By giving fire to humans Prometheus had potentially threatened the survival of the Gods themselves. 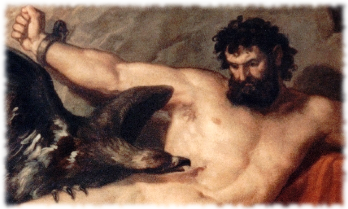 For punishment Zeus immediately ordered Prometheus chained to a rock. There he was to stay in misery for all eternity as an eagle sat there slowly pecking out his liver during the day. Because he was immortal each night his liver would grow back, making his days an endless row of excruciating pain. Luckily a few years later Hercules came by and got rid of the eagle and freed Prometheus from eternal torment. But human beings were not so lucky. 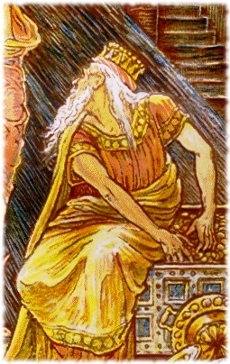 Just because humans had nothing to do with getting fire didn’t mean that Zeus was going to let them escape his wrath. He was *ahem* burning mad and intended on showing humans who was boss. He ordered a new type of human created, not a man like the rest, but a woman. Her name was Pandora and all of the Gods on Mt. 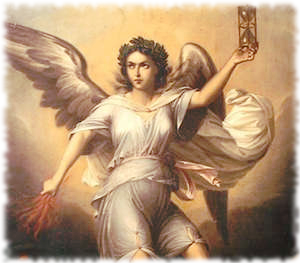 Olympus gave her a gift, some were nice and some were mean, but Zeus himself gave her the gift of curiosity. Then he set his plan into action. 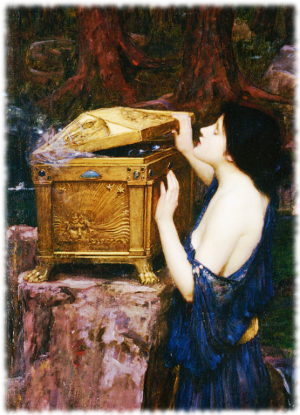 When he sent Pandora to her new life he put a beautiful golden box in her hands. He ordered her to keep it but said to never ever open it as long as she lived. Well as you can imagine, try as she might when she got to her new home she just couldn’t get her mind off of what might be in the box. No matter if she hid it in a corner or tried to completely remove it from the house it just wouldn’t work. One day she couldn’t stand it anymore and figured she’d just take a peek into the box for a second. But as soon as she lifted the lid it flew open and all the evil spirits it contained went out and spread over the earth. According to Greek mythology this is how most of the sorrows of the world were unleashed on humanity. All the problems of disease, war, sorrow, and on and on. As you can imagine Pandora was horrified at what happened, and even more, she was terrified that Zeus would strike her down for not following his orders. But he never did anything about it at all since everything went according to his plan, now he’d gotten his revenge on humans. So this my friends is the story behind the saying ‘opening Pandora’s box’. In the time of the ancient Greeks this story was a way for them to try and understand why things like disease and war existed. Of course nowadays we’re much more advanced and know that the problems of the world weren’t released from a box by a lady named Pandora. 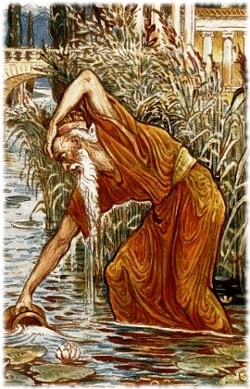 But there’s still something we can learn from this ancient story: curiosity is a great gift, but think before you act, or else you might end up releasing all sorts of problems into your life!